Don’t let the resemblance to Quaker’s rice cakes fool you. Magdalena Abakanowicz’ equally stale wheels of limestone aren’t nearly as tasteless as the originals. This take on the lightly salted snack was the artist’s first foray into stone-working, inspired by her initial encounter with Jerusalem in 1987. The piece’s title comes from the Negev Desert in Israel and its Mitzpeh Ramon quarry, from which Abakanowicz gathered the stone. However, the central feature of the piece are the little belly-buttons carved in the middle of many of the stones. Apparently, Abakanowicz saw these indents as Jerusalem’s dot on the map—smack-dab in the middle, the origin of the world. The only question is what she did with all the missing umbilical cords. Of course, something can be read into her “innie-affinity,” as none of the stones feature protruding navels. Perhaps a bit belly-ist of her, but I prefer to give Abakanowicz the benefit of the doubt and assume it was an oversight. That she’d spent too much time in the rock pit to imagine other omphalic options. Still, we stand with you outie activists and respect your right to be miffed! 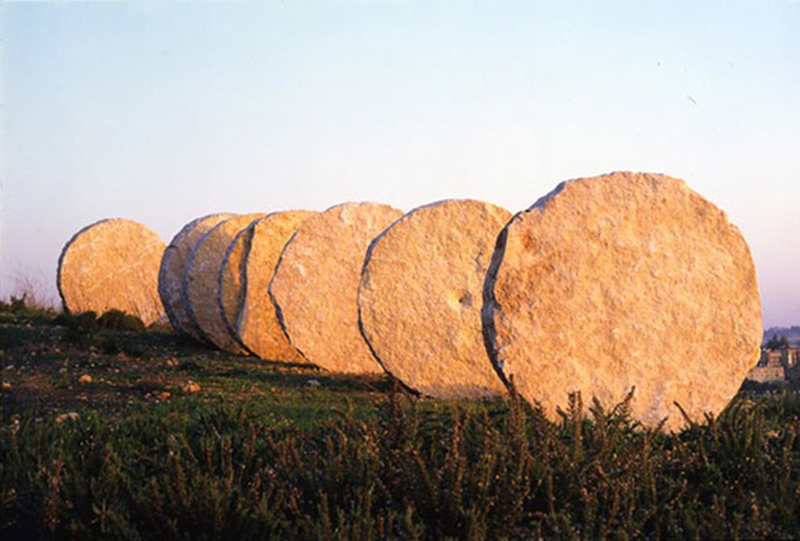 Abakanowicz’ Negev-henge is made from seven discs weighing ten tons each. The number seven could refer to the seven days of Creation or other age-old spiritual stories centering on Jerusalem, which leaves the sculpture in some sort of divine discombobulation, despite the limestone being rife with age-old fossils. (We stand less with Creationists.) However, unlike most of the Seven Wonders of the World, Abakanowicz’ rice cracker stones are still standing, intact and totally inedible.